Did Avidyne Strike Gold At NBAA? As soon as CitationJet and King Air owners started hearing about the so-called G.L.A.S. package, they began to overrun Avidyne’s NBAA exhibit space. ADS-B are four letters (and a hyphen) that strike fear into the hearts of aircraft owners, at least those who have yet to equip their birds with the next-gen surveillance gear, which the FAA is mandating be in the cockpit for essentially all business aircraft (and lots of non-business aircraft, too) by January 1, 2020. At NBAA earlier this week Avidyne announced that it had a solution to the ADS-B problem, which it calls “G.L.A.S.,” for GPS Legacy Aviation Support--perhaps it's not the greatest acronym, but wait until you hear what it does. The announcement might not have seemed like big news at the time, but once owners caught wind of the offer, the appeal of it was immediately clear. 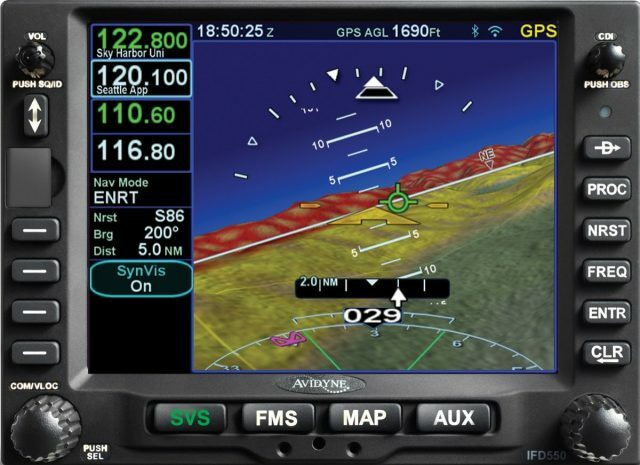 IDF-550 multi-function navigator from Avidyne. The Avidyne "fix," which is much more than just making the plane ADS-B compliant, involves installing the company’s IFD550 multi-function navigator, which does the ADS-B thing very nicely and includes a built-in ADS-B compliant WAAS receiver. It also has a wealth of other great stuff. It’s a terrific navigator—we flew and loved the IFD540 version of the product—it has built-in attitude reference sensor and 3D synthetic vision, touch and/or bezel control, built in nav-comms, terrain alerting, approach charts, and more, so in addition to the ADS-B component, owners get tons of additional features, and at a cost that’s a lot less than updated the factory installed legacy hardware. Avidyne estimates that it could be half the price and a fraction of the time of competing solutions, while, again, bringing tremendous additional features and capabilities. The other part of the equation—yes, more value-added capability—is that IFDs with G.L.A.S. will drive existing displays—EFIS displays and even mechanical HSIs—to display LPV approaches, something they are currently incapable of doing. Avidyne pulls this trick off by essentially getting the FMS to drive the nav needles in such a way as to make them behave as though they are flying an LPV approach instead of an ILS. WAAS approaches, of course, hadn’t been invented when many of these systems were installed. The end result to the pilot is transparent. Avidyne says its GLAS package will typically go for under $100,000, in some cases a great deal under that figure. While that still might sound like a high sum, compared to the alternative of paying as much as $200,000 or $250,000 for a legacy solution… well, it quickly becomes clear why owners were excited by the prospects.